Let me preface this article by saying coming up with survival uses for bandanas really wasn’t hard considering bandanas have been used in survival situations for decades. However, what you might not realize is this little 2 foot squared piece of cloth is actually much more useful than you ever imagined. This is why I recommend any person interested in preparing for the worst to read through this list. After reading this list I challenge anyone to find a reason not to get a bandana or two. Especially considering they’re remarkably inexpensive, lightweight, compact, and so darn versatile. Take a look at this list and then when you’re done leave a comment and let me know what other uses I could include. 1 – Use it to prevent snow blindness: Roll it up like a headband, cut eye holes in it and tie it around your face to help absorb the reflected light of the sun and keep your eyes protected. 2 – Use it as a pre-filter for water: You can stretch a bandana over the mouth of a water bottle or a pot and pour water with heavy amounts of sediment over it. This will filter out all the gunk so you can sterilize your water. 3 – Use it for gathering food: You can use a bandana to store food you forage. Just tie the four corners together and you’ve got an improvised basket. 4 – Use it to tell the direction the wind is traveling in: Make a windsock with a bandana by tying the four corners around a stick (or holding it) and allowing the bandana to act as a sail to catch the wind. This is helpful if you’re trying to determine weather. 5 – Use it to keep sweat out of your eyes: The sensation of salty sweat invading your eyes is as unpleasant as it gets. Fold a bandana over itself several times and then tie it around your forehead to keep the sweat from ever getting in there. 6 – Use it to start a fire: Most bandanas are made of cotton, and cotton is quite flammable. If you’re in need of a fire you can use portions of your bandana to help start that fire in seconds. 7 – Use it as a seat cushion: You can fold a bandana up into a square and then sit on it for comfort’s sake. This is especially handy if you’re out in the wilderness where padded seats aren’t all that common. 8 – Use it as a dust mask: Tying a bandana around your face is a great way to keep invasive dust out of your airways. 9 – Use it to prevent frostbite on your face: In the same way a bandana can be used to keep dust out of your nose and mouth it can also be used to keep your face warm. The bandana around your face will trap warm air and keep it close to you where it belongs. Even better is it will eventually ice up and help form a shield to keep your face protected. 10 – Use it as a dog collar: Need to keep your best friend close by? A bandana and some paracord can easily help fashion a collar and lead for your best friend. 11 – Use it as a pot holder: No need to carry an oven mitt around when you have a bandana. Just fold it over itself several times and you can safely remove hot items from a fire with ease. 12 – Use it as a distress signal: Using the universal distress call pattern you can signal to others you need help with nothing more than a bandana. 13 – Use it to stay cool in hot weather: A damp bandana wrapped loosely around your neck can help keep you cool in the hottest weather. By cooling blood that flows to your head it will help you stay cooler. 14 – Use it to clean dirty pots and pans: In a survival situation sanitation is difficult. A bandana can be used to help clean excess food off of pots and pans. When finished wash out in a stream or creek and then if needed use tip 13 to stay cool. 15 – Use them in place of TP: If you want to reuse them make sure to thoroughly clean. 16 – Use them to muzzle your dog: If your dog has a tendency to nip or bite then a bandana tied around their muzzle can help curb this unappealing behavior. 17 – Use it as an arm sling: In the event of a medical emergency you can use a bandana to help immobilize the affected limb. 18 – Use it as a hobo bag: You no doubt are familiar with the image of a hobo with a staff draped over his shoulder with a bandana hanging off from the end. If you need to carry extra items with you then this is a great DIY project to extend your carrying capacity beyond what you have. 19 – Use it as excess cordage: While I recommend having paracord on hand a bandana can serve as cordage too. Tearing strips of bandana and then twisting them together can give you lengths of cordage for a variety of purposes. 20 – Use it as a tourniquet: If you ever need one a bandana can be used as a tourniquet for a survival situation. It’s important to understand how to use a tourniquet properly though (don’t just tie the bandana around the affected limb and expect a miracle). 21 – Use them to mark location: Tying a whole bandana or strips of bandana around trees is a great way to mark out a trail, or a destination to help prevent getting lost. 22 – Use it to prevent chafing/hotspots: If you’re spending a lot of time hiking with a pack then a bandana is perfect to help reduce chafing. You can wad up the bandana and place it at the location of your hotspot to prevent chafing or blisters. 23 – Use it to clean your gun: The soft, pliable nature of a bandana allows for you to clean your gun well. Whether you’re using it in combination with gun oil, or cleaning it dry, a bandana can help keep your firearm in working order. 24 – Use it as a weapon: David killed Goliath with nothing more than a smooth stone and a sling and if you’re so inclined you can do the same thing. 25 – Use it for stringing up anything: If you ever need to hoist an object up then a stone wrapped in a bandana attached to some paracord can help you with the task in a jiffy. Just wrap the stone or any heavy object in your bandana and attach a piece of paracord and throw it over a limb to make things happen. 26 – Use them as handcuffs: If you’re in a situation requiring the immobilization of a person you deem to be a threat then you can use a bandana to accomplish this. Make sure to tie your knot very, very tight to help prevent their escape. 27 – Use it to help you sleep: If you’re trying to catch some shut eye a bandana draped over your face will help a ton. Like I mentioned, bandanas are cheap. And as you might have noticed there were a lot of survival uses for bandanas that required you use cordage. 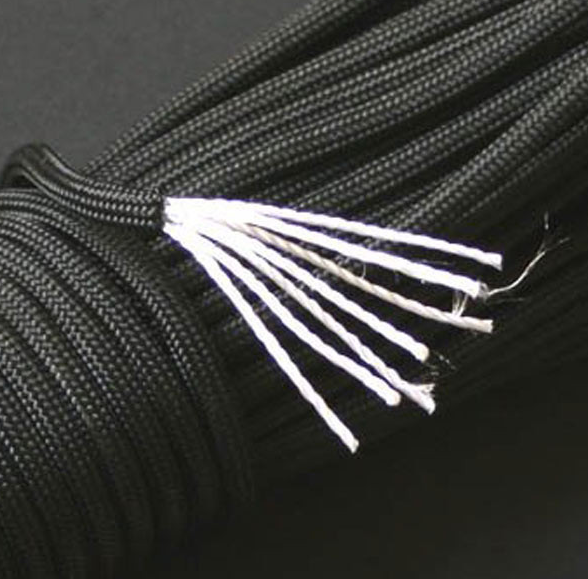 The recommended cordage for many of these applications is 550 lb. paracord. 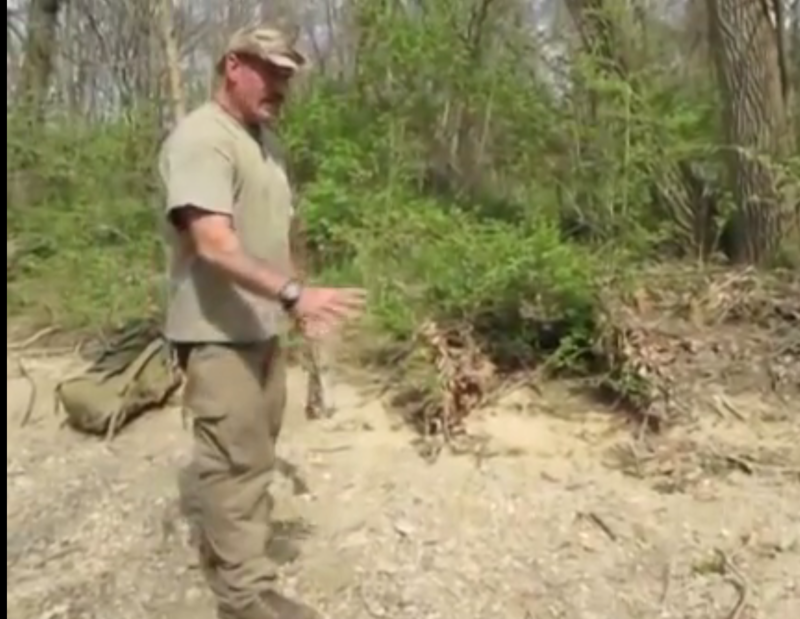 This durable and versatile tool is one of the most useful tools a prepper could ever own. And we’ve got it for a phenomenal price. Click here or on the image below to get our affordable 100″ length of paracord today! This entry was posted in Uncategorized on March 2, 2016 by Survival Frog.